Old Station Tintern01291 689566work Visitor CentreThe Old Station nestles beside the River Wye in the heart of the Wye Valley in Tintern. This idyllic 10 – acre site boasts the best of what Monmouthshire has to offer. The Old Station has developed an excellent reputation as one of the area’s top visitor centres. The site has held the coveted Green Flag award since 2009. The Old Station is a wonderful hub for walkers, and its impressive facilities make it an ideal small conference venue – just the place for an office away day. There are three railway carriages on site. Two carriages contain a souvenir and gift shop, a Destination Wye Valley exhibition area with information about the heritage of the Wye Valley, a tourist information point and a meeting room, which when not booked out shows a film about the railway and surrounding countryside. The third smaller carriage houses a scale model of the station as it would have been in the 1930s. For the younger visitor there is a full programme of activities available daily, including miniature train rides (on selected days), a play area and a 30 metre aerial zip slide. There is also a small campsite but booking is essential. The campsite has no vehicle access and does not have facilities for caravan and campervans. 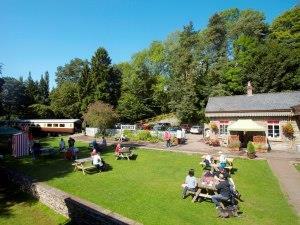 The Old Station nestles beside the River Wye in the heart of the Wye Valley in Tintern. This idyllic 10 – acre site boasts the best of what Monmouthshire has to offer. Children's activities available everyday. A full activity programme is available by request. 9km north of Chepstow on A466. 1km north of Tintern Abbey.